Anyone who has allergies knows firsthand about the invisible triggers that pop up throughout their home all year round. This can be frustrating, especially if you have severe allergy symptoms, but life doesn’t have to stay that way. There are several ways to reduce indoor allergens that are easy to do and can provide long-term relief. In this post, we’ve rounded up the tops ways how to get rid of allergens in your home. But first, let’s go over what are indoor allergies and the most common triggers. Then we’ll share the things you can do to make your house allergen free today. Your immune system’s job is to protect your body from what it sees as threats. It produces antibodies in response to any perceived threat. When someone has allergies, the immune system sees things like dust, pet dander, and pollen as threats, even though they’re technically harmless particles. In response to this perceived threat, your immune system will go into overdrive and produce the antibodies it needs to fight off the allergens. When this happens, an allergy sufferer can experience common symptoms of an allergy flare including itchy eyes, sneezing, runny nose, coughing, and more. Many people think that they are born with allergies. While this often true, it’s also true that allergies can develop as you age. The severity levels of indoor allergens may change and fluctuate as well. Some people experience allergies worse in the spring and fall months, and some experience them year-round. Your personal experience depends on the your individual immune system response. Before we talk about how to make a house allergen free, it’s good for you to know what the most common allergy triggers are indoors. This will help you know what to look for and make the job of getting rid of them much easier to accomplish. Dust is everywhere, and it’s a major contributing factor as to why over 50 million Americans suffer from allergies. 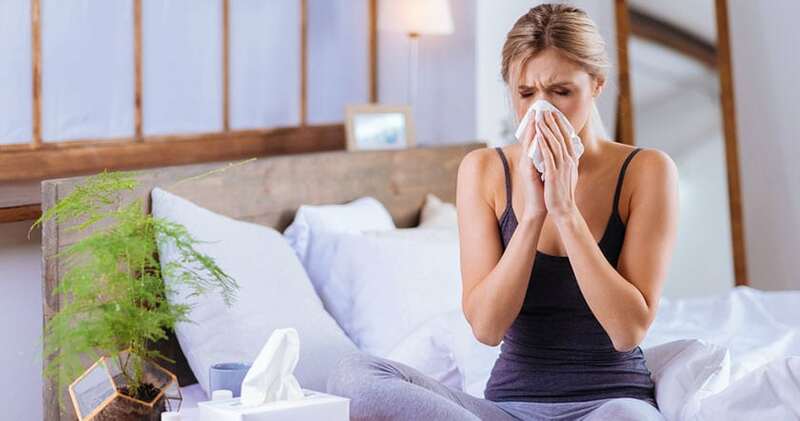 Unexpected coughing, watery eyes, and sneezing are a good indication that you have this allergy, and it’s one of the top five most common indoor allergens. Dust mites feed off of dust particles in your home and they thrive in humid environments. These critters are commonly found in your bedding, drapery, and fabric, even if your home isn’t particularly humid or warm. There are more than 1,000 different species of mold in the United States alone, so it makes sense that this is a big allergy trigger. A lot of these mold species aren’t visible to the naked eye, and since their spores are so tiny it makes it easier for them to travel through the air and into your respiratory system, causing an allergic reaction. Mold grows fastest in in damp environments, so be sure to check your bathroom tiles and flooring, windowsills, under any sinks, inside your AC, and anywhere you may have dampness gathering for indications of mold growth. Nitrogen Dioxide is a gas that’s known for coming from fossil fuels or road traffic, however, it’s also released by some indoor appliances. If your home has a gas stove or furnace, you’re at a higher risk for exposure. Continued exposure to this gas can lead to lung problems or respiratory system irritation. You’ll want to check for good ventilation around your stove and heating system. It’s also a good idea to crack open a window in the general area when you’re using your kitchen stove or have a fan running to circulate the air. Around every three out of ten Americans have some form of pet dander allergy. Pet dander consists of tiny pieces of dead skin that flake off your pet each day. It’s also present in a protein found in your pet’s feces and saliva. Pet dander has ragged edges and sticks to just about everything. Even if you don’t own a pet, you can still have pet dander in your home. This allergen is easily picked up from public places and other people’s homes that have pets. Rodent and roach droppings can be an allergy trigger, and sometimes they’re so small that you don’t recognized them in your home. It’s a good idea to regularly check your home for signs of these pests, and set out traps as necessary. If they go unchecked, it can lead to bigger health concerns. Now that you know what the common allergies are in your home, we’ll now move on to answering the question, “How to make my house allergen free? Following these tips can greatly reduce the amount of indoor allergens around your home and lower the chances of a flare up. Ideally, you want to wipe down your tables, windowsills, and other surfaces each day to prevent dust buildup. You can dust your moldings, ceiling fans, floorboards, and blinds once a week to reduce the dust that collects there as well. When dusting, use a microfiber cloth or a damp rag. Feather dusters just push dust around and can spread it to other areas of your home. An air purifier is a quick way to filter the air you’re breathing in your home. You can set it in the rooms you use the most and let it cycle the indoor air through a series of filters. A HEPA allergen air purifier is the best type to get since it catches most of the dust, pet dander, mold spores, and other common allergens before they have a chance to get into your lungs. Higher humidity causes dust mites to thrive, so you want it lower throughout your home. If it’s possible keep your humidity levels below 50%. This will slow down (or even eliminate) dust mites. Allergens like pet dander can stick to all types of flooring, so it’s important to sweep and vacuum regularly. Hardwood floors and tile should be swept once per week. Carpets should be vacuumed every few days. If you have pets in the home, you should consider cleaning the most heavily used rooms once a day, if possible, to reduce allergens from building up. As you’re well aware, indoor allergens can be a very annoying problem, especially if you have a severe case of them. Hopefully this short guide has helped you helped you identify the common allergens in your home and given you a few ideas for how reduce their presence so you can get relief. Video: How Does an Air Purifier Work? Video: What is an Air Purifier and What Does it Do?